For the hockey arena, see Powerade Centre. In 1988, Powerade became the official sports drink of the Olympics, alongside Aquarius, another sports drink made by Coca-Cola. It is a rival of another sports drink, Gatorade. In July 2001, The Coca-Cola Company launched a new formula for Powerade including vitamins B3, B6 and B12, which play a role in energy metabolism. In July 2002, The Coca-Cola Company updated the bottles of the standard Powerade (previous logo styling) to a new sport-grip bottle. In 2002, The Coca-Cola Company introduced Powerade Option to the United States, in response to Gatorade's popular Propel. Option is a "low Calorie sports drink" that is colorless and sweetened with high fructose corn syrup, sucralose, and acesulfame potassium, to provide sugar-conscious consumers with another rehydration choice. Powerade Option took 36% of the Fitness Water category behind Propel's 42%. In 2007, Powerade Zero was released, a sports drink with electrolytes, which contains no sugar, no calories and no carbohydrates. Powerade Option was subsequently discontinued. In June 2009, The Coca-Cola Company bought Glacéau, owner of brands such as VitaminWater and SmartWater, for $4.1 billion, a price tag that signaled the company's seriousness in pursuing growth of non-carbonated beverages. Since then, the company has also given its Glacéau management team control of its Powerade sports drink brand. Powerade's main competition is Gatorade marketed by the Quaker Oats Company, a division of PepsiCo. Gatorade, which was branded at the University of Florida in 1965, was the first commercially available sports drink in the United States. It now holds a commanding share of the market. As of 2011, Gatorade held a 70 percent market share to Powerade's 28.5 percent. All Sport is a competitor marketed by All Sport, Inc. and distributed by the Dr. Pepper Snapple Group. All Sport was marketed by PepsiCo until 2001, when Gatorade's maker, the Quaker Oats Company was acquired by PepsiCo. All Sport was sold to the Monarch Beverage Company soon after. Powerade and All Sport have each been distributed through their own direct store deliver channels. It was subsequently purchased by Gary Smith, the Chairman & CEO of All Sport, Inc. based in Austin, Texas. Outside the United States the Lucozade energy drink (manufactured since 1927 by the pharmaceutical company now known as GlaxoSmithKline) competes with Powerade. Lucozade's formulation differs in that it uses primarily glucose and contains caffeine. The more direct competitor to Powerade and Gatorade is Lucozade Sport. Powerade is the official sports drink of the Australian rugby league team, the Australian and Ireland rugby union teams, PGA Tour, NASCAR (2003–present), NHRA, NCAA, the U.S. Olympic Team (excluding U.S.A. Basketball and U.S. Soccer, which have deals with Gatorade) and many other national Olympic federations, The Football League and many other soccer leagues and teams around the world, FIFA, such as Rangers F.C, Club Universidad de Chile, Associação Atlética Ponte Preta, Independiente de Avellaneda, O'Higgins or Club Atlético River Plate and the IOC in no small part due to their overall contracts with Coca-Cola. Various other competitions also have sponsorship deals with the brand, although Gatorade historically has secured the lion's share of sponsorships. The drink is also Sponsor of the Honduran Soccer Team C.D. Olimpia. Powerade is the Official Hydration Partner of Melbourne Storm. The brand is also the exclusive beverage sponsor of the Hoops in the Sun basketball summer league, based out at Orchard Beach in the Bronx, New York. It is the only summer basketball league to be sponsored by the brand. Powerade Play (a reduced calorie version targeted towards children) Mixed Berry, Fruit Punch, Orange, and Grape flavors in 12 ounce bottles. Like its main competitor, Gatorade, Powerade is made with sugar, syrups and salt. One Powerade ad campaign saying that Powerade ION4 is superior to Gatorade has been accused of being deceptive and false by Pepsi, the parent owner of Gatorade. The courts ruled in favor of Powerade as of August 2009. ^ "Powerade vs. soda? - FoodAQ". foodaq.com. Retrieved 6 April 2015. ^ Kristin Goett (June 9, 2016). "Best Sports Drinks". Archived from the original on August 11, 2016. Retrieved June 23, 2016. ^ "PowerAde's zero-calorie sports drink takes on Gatorade — USATODAY.com". usatoday.com. Retrieved 6 April 2015. ^ "Adweek: How Powerade Downed Gatorade in Court, August 6, 2009". Retrieved 28 October 2017. ^ Shareen Pathak. (2 March 2012). "Watch the Spot: No. 2 Powerade Launches 'Underdog' Campaign - News - Advertising Age". adage.com. Retrieved 6 April 2015. ^ Chen, Xinlei (Jack); John, George; Narasimhan, Om (2008-05-01). "Assessing the Consequences of a Channel Switch". Marketing Science. 27 (3): 398–416. JSTOR 40057143. ^ "COMMERCIAL PARTNERS - The Football League - Commercial - Commercial Partners". Archived from the original on 18 May 2008. Retrieved 28 October 2017. ^ Media, NRL Digital. "Powerade renews sponsorship of Storm for 2015". Retrieved 28 October 2017. ^ "Powerade". bevnet.com. Retrieved 6 April 2015. ^ "Sports Drinks: Winners and Losers". ABC News. ^ "POWERADE - The Official Website for Powerade". powerade.com. Archived from the original on 24 October 2015. Retrieved 26 October 2015. ^ a b "Powerade Citrus Passionfruit, Kiwi Pineapple". bevindustry.com. February 27, 2017. Retrieved 1 Mar 2017. 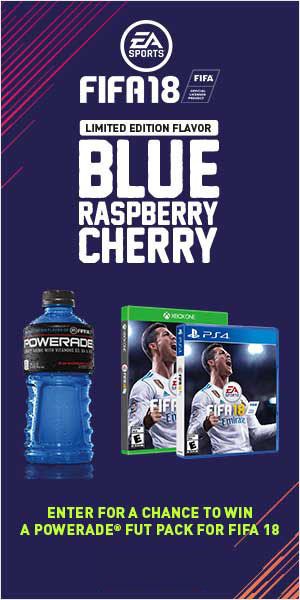 ^ "Powerade Blue Raspberry Cherry". richcontext.com. Retrieved 30 Sep 2017. ^ "7-Eleven NCAA March Madness Bracket Refresh". powerade.com. Retrieved 26 Mar 2018. ^ "Powerade". www.coca-cola.ee. Retrieved 2018-07-13. ^ Melanie Warner (August 22, 2005). "Critics Say Soda Policy for Schools Lacks Teeth". New York Times. This page was last edited on 22 April 2019, at 21:19 (UTC).